I did some work on an interesting project to keep a standby database in sync with a production primary database manually. This is not a true standby database as the primary database does not communicate with this standby database. Due to certain reason, we could not configure Data Guard to allow data replication between these two database. So no way to do the redo log shipping like we do in Data Guard environment. What I mean manually is we take the archivelog backup from the previous day, restore and recover to this standby database. As this database is a VLDB, the volume of daily archive log files is in size of multi-terabyte. We use an Exadata X-4 full rack to host this standby database. Even with restoring using all db nodes and 200+ channels, it still take several hours for restore only. And similar timing in recovering these archive logs. Not mention the time copying file between two data centers. It takes a lot of efforts to keep up with production primary database and reduce the lag between these two databases. The benefit doing this manually is the minimum impact in current production environment. The only overhead on production db is when copying files to Exadata. The impact is quite low. We scp rman backup pieces using all 8 db nodes to maximize the utilization of band width. One major task during this restore and recover is to identify the correct restore and recover point from the daily rman backupset for the archive logs. Identify the right recover point, different people might have different opinions. 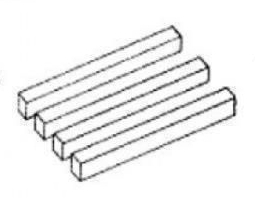 Just like the image below, how many bars can you see, three or four? There are many blogs and articles discussing the way to identify the correct restore and recover points. The majority of people like to use v$archived_log view to get the recover point. In my scenario, it did not work well as I can get the correct recovery point only after I restore all the archive logfiles. What I want is after cataloging the rman backup piece, what are last applied archive log sequence for each thread, and what are my next recover point for the current rman backup pieces that are just cataloged. Using both v$archived_log and v$backup_archivelog_details views, I created a script that can help me answer all the questions I have. select ' restore archivelog from logseq ' || applied_arc.startNo || ' until logseq ' || catalog_arc.endNo || ' thread=' || catalog_arc.thread# || ';' "Restore Command"
select distinct 'Thread ' || thread# || ': last applied archive log ' || sequence# || ' at ' || to_char(next_time, 'MON/DD/YYYY HH24:MI:SS') || ' next change# ' || next_change# "Applied Logs"
select 'Thread ' || thread# || ': last cataloged archive log ' || sequence# || ' at ' || to_char(next_time, 'MON/DD/YYYY HH24:MI:SS') || ' next change# ' || next_change# "Catalog Logs"
select 'set until sequence ' || seq# || ' thread ' || thread# || '; ' || chr(13)|| chr(10) || 'recover database delete archivelog maxsize 4000g; ' "Recover Command"
The following example shows the execution of the script. It shows that we completed the restore and recover of Sep. 16’s archive logs and the recover point for Sep. 17’s archive logs is sequence 309397 thread 3. How to do tagging efficiently in Terraform?